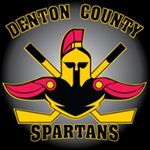 The Denton County Spartans Hockey Club competes in the AT&T Metroplex High School Hockey League. The team includes players who attend the following: Argyle ISD, Carrollton-Farmers Branch ISD, Denton ISD, Little Elm ISD, Hebron HS, Lake Dallas ISD, Lewisville HS and The Colony HS. If you attend one of these schools or are home-schooled and live in one of these districts, you are eligible to join our team. Students in grades 7 through 12 are eligible to play. Register now for the summer season! Please consider making a tax deductible donation to our organization ($50 minimum). Use the PayPal donation button below and you can help support our players. This is a great opportunity for friends and relatives too!